Nigeria's leading homes merchant, Adron Homes and Properties is set to give its customers the best treatment this festive season with ' Festival of Lemon ', an ending of the year treat to loyal customers of the organisation which will be coming up tommorow Sunday, 23rd Of December, 2018 at Federal Palace Hotel, Victoria Island, Lagos. 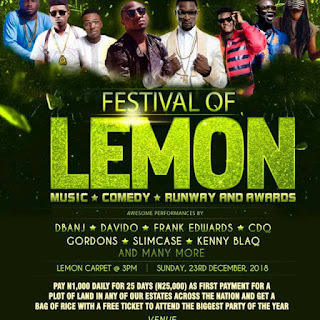 Festival of Lemon isn't just another end of the year party but one which promises to put the attendants in an atmosphere that has never been experienced. Apart from the celebrities, it will also be a gathering of royalties and distinguished guests like the Lagos state Governorship Candidate of the APC, Babajide Sanwoolu, the Akarigbo of Remo Land, His Royal Majesty, Oba Babatunde Adewale Ajayi, the Oluyomade Torungbuwa II, Ooni Of Ife, Oba Adeyeye Enitan Babatunde Ogunwusi, Ojaja II, Senator Ben Murray Bruce, The Bruce brothers. Furthermore, it will also be an avenue to raise home owners. Adron Homes has stated that Prospective clients who come to the concert will have the rare opportunity to get landed properties with a 30percent discount. It will be recalled that Adron Homes has always given surprises to their customers every festive period. The Easter season is always for Adron Happy Hour, Children's day isn't always an exception, the Muslim festive period isn't exempted too while December is always dedicated for Lemon Friday.